Kara came to the Weare Animal Hospital in 2006 after moving to Weare with her husband. She has a Bachelor’s degree in Aviation from Daniel Webster College. She both flew and served as a flight attendant for private and chartered flights. After 9/11 Kara decided she needed a change. Animals have always been her second love, so she began working as a veterinary assistant. Kara has a special interest in assisting with surgical procedures. 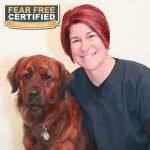 Her duties range from setting up the surgical suite, monitoring pets and assuring they are pain free, and also making sure all instruments are sterile and rid of germs. If your pet is here for any type of surgery, you can expect to find Kara by their side for the entire day. Kara has a Rotti/Boxer cross name Phoebe. She and her husband have two sassy little girls that keep them very busy. Kara enjoys taking her dog for runs in the wee hours of the morning and reading murder mysteries when she finds the time. The family enjoys vacationing in Vermont at their family camp by the lake.